Google will pinpoint nearly every railroad crossing in the U.S. While the auto industry and government agencies dither over standards for a vast vehicle-to-infrastructure wireless communications network that could warn drivers of impending danger, along comes a simple Silicon Valley workaround. Google, responding to a call from the Federal Railroad Administration to help reduce the occurrence of train-vs.-car crashes, has agreed to work with the agency to pinpoint nearly every one of the nation's roughly 250,000 railroad grade crossings and integrate the data into the Google Maps smartphone app that many drivers routinely use for navigation, according to a New York Times report. No timeline was announced. When drivers use the turn-by-turn navigation feature, Google's app would send them audio and visual alerts that a rail crossing is coming up. The agency is calling on other providers of navigation maps to build in such alerts as well. "We have some really good data on these crossings," Sarah Feinberg, the Federal Railroad Administration's acting administrator and a former Facebook communications executive, told The Times. "But we have to put the data where people are using it." 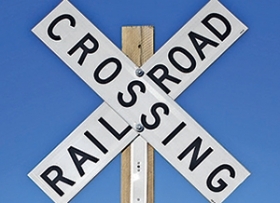 The agency said 94 percent of accidents at rail crossings were due to driver inattention and error. In many instances, The Times reported, there are no gates or blinking lights to warn drivers of an oncoming train -- only a sign marking the crossing.